I didn’t think I could be surprised by a new Kindle, but, well, Amazon got me with the Kindle Oasis. In more than one way. It’s weird-looking, and the $290 price tag is shocking. 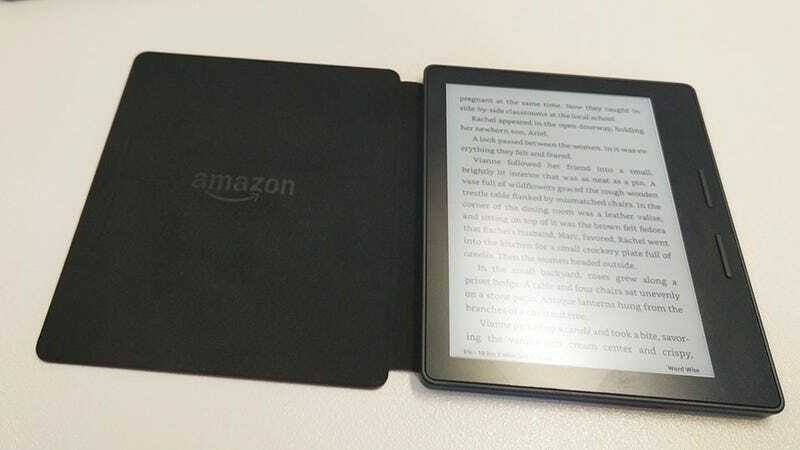 That leak earlier this week was bang on, and Amazon’s latest e-reader has an unusual design that’s different from any other reading slab the company has produced over the last eight years. The device has a rectangular bulge, from which the body tapers down to a 3.5mm point. It’s very weird looking, but the bulge also contains the device’s processor and battery, and acts as a grip, concentrating a bulk of the Kindle’s weight in the palm of your hand. I’ve spent the last few years using a Kindle Paperwhite, and never found holding that e-reader with one hand too difficult. That said, the new Kindle practically disappears into your palm. It’s super light—just 4.6 ounces—and when you hold it in your hand, it’s almost like the thing’s not there. Further enabling your one-handed reading adventures are the physical page turn buttons that are easily accessible to your thumb on the front bezel. The display is the same lovely one on the current Paperwhite. And if your one hand gets tired (or if you’re left-handed), don’t worry, the Oasis swings both ways. The device has a built-in accelerometer, so the display’s orientation flips depending on whether you’ve got it in your left or right hand. As with many other gadgets, making the Oasis very compact and light comes at the expense of battery, so Amazon’s designed a special battery case for the Oasis. (The battery case is included in that $290, don’t worry.) The Oasis magnetically snaps into the flip-cover case, making the whole thing a nice rectangular package. For its odd design, this seems like a satisfying and premium device. Maybe too premium. Remember, the Oasis joins the basic Kindle, Kindle Paperwhite, and Kindle Voyage, which are all considerably cheaper ($80, $120, and $200 respectively). Unless you are really, really logging an outrageous number of hours on your e-reader the benefits of this $290 device might end up being marginal. Which doesn’t mean it’s not nice, it just might not be worth it. Of course, I’ve only had just a few moments with the Oasis, we’ll be sure to report back when we’ve had some proper time reading on it. The Amazon Kindle Oasis is available for pre-order today and ships April 27th.